While I’ve used autofocus lenses on several previous cameras, I’ve mostly been happy using my Sony A7RII mirrorless camera with a carefully selected set of prime lenses, all of which are manual focus. They work fine for the great majority of my photography projects, but there are times, particularly when photographing at family events or taking other moving subjects, when I have to concede that having access to auto focus would be a great advantage. When I saw Techart Pro’s first advertisements for their Leica M to Sony E mount auto-focusing adapter I was immediately interested, particularly given that they also advertised the availability of adapters allowing it to be used with a range of other lens mounts. Initial reports with the first firmware indicated less than ideal performance, with not particularly rapid focus and occasional camera lockups. But then reports on a forum at fredmiranda.com of dramatically improved performance with the newly arrived v. 3 firmware suggested that Techart Pro were beginning to iron out the worst of their teething problems. I decided to put my money down! Buying the TAP adapter was straight forward via their website (TechartPro.Com), although there was a delay of around five weeks in delivery from when I ordered in late July, reflecting the high demand for this product. Since then supply problems seem to have eased, and at the time of writing the adapter is available for immediate shipping from a number of suppliers advertising on the internet, including B&H Photo and Video. In New Zealand the adapter is sold by ProGear in Auckland. I also ordered an FD-VM adapter to allow me to use the several FD mount lenses I own – more about that later. My adapter arrived sporting firmware v. 3, and immediately kicked into life when I tried it on my A7RII. However, I decided to check the Techart Pro website to see if there were any further firmware upgrades, and found that they had just released version four of their firmware. Despite the sketchy nature of the documentation that came with the adapter, I decided to attempt the upgrade via a bluetooth link with my cellphone. After downloading the Techart Upgrade app to my Android phone, I was able to successfully select and install the new firmware. This requires one to first shoot a frame with the camera aperture set to F/90 to turn on the adapter’s blue-tooth communications, after which the camera is turned off – detailed instructions for this process can be found at the FAQ page for the TAP adapter on the Fred Miranda website. This website also contains a wealth of information, which has been very helpfully compiled from an earlier discussion of the adapter that extended across about 40 pages. Once the firmware was updated, the adapter proved very easy to use – that is, mount any lens – M-mount or FD via the FD-M adapter – and it focused well even when moderately stopped down; it even seemed to perform well in the low light conditions under which other users had complained of poor performance. With time, and as reported on on-line forums, a lot of this smooth performance reflected the improvements made in v. 4 of the firmware, which eliminated many (but not all!) of the bugs experienced with previous versions of the firmware. While the TAP adapter works by fooling the camera body (A7II or A7RII) into behaving as if it has an autofocus lens mounted, it has no ability to automatically detect and pass back to the camera information about either the focal length of the lens being used, or the aperture to which it is set; this reflects the lack of electronic coupling between the lens and the adapter. It does however, pass to the camera a nominal lens name and focal length, as stored in the adapter under the control of the firmware. Once a lens is mounted, all exposures are made with the camera aperture set to F/2, and the user is required to manually set the aperture on the lens to whatever setting they require. In fact, when using the TAP adapter, the camera will only give a correct exposure if the aperture setting on the camera body is set to F/2 – images can be taken using other apertures, but they will be progressively overexposed as the aperture setting on the body is increased. Now here’s the tricky bit – Techart Pro have configured the adapter so that an exposure made when the camera aperture is set anywhere in the range from F/11 to F/32 changes the focal length setting that is passed from the adapter to the camera for any subsequent exposures. For example, (unless changed by the user – see below) taking an image at F/11 sets the focal length passed to the camera to 15 mm, taking an image at F/16 sets the focal length to 24 mm, and so on. This focal length information is not only written into the exif for each following image, it is also available to be used to configure the automatic setting option for in-body image stabilisation (IBIS). In practice then, when changing lenses, exposing a single (overexposed!) frame at the required aperture setting on the body will change the focal length that the adapter passes back to the camera body for all subsequent exposures – remember that the aperture on the camera body must be set back to F/2 for these subsequent shots or they will be over-exposed. Having got my head around this somewhat out-of-left-field way to control interaction between the adapter and my camera, I found that I was able to use these camera aperture shots to quickly reset the adapter focal length to match my lenses – F/14 for my 21mm Ultron, F/22 for my FD 35 mm, F/25 for my M-Hexanon 50 mm, and F/29 for my Elmarit-M 90 mm. Each time I swapped lenses, I exposed a single initial frame with the camera body aperture adjusted to the required setting, and then returned the aperture setting to F/2 for all subsequent shots. I then predominantly shot in aperture-priority mode, altering the lens aperture to control depth of field and the exposure compensation dial to fine-tune the exposure. A second change in setup that made the TAP easier to use was to fine tune the assignment of my camera buttons. First, I reset the MF/AF button to its original setting, allowing rapid switching between automatic and manual focus. In addition, at the suggestion of a fellow forum contributor, I reassigned my right-hand 4-way controller button to ‘IBIS on/off’, and my downward 4-way controller button to ‘Steady shot adjust’ – the latter enables switching between manual and automatic setting of the IBIS focal length. My custom button 1 was already set to allow manual adjustment of the IBIS focal length, and my custom button 2 was set to ‘Focus settings’. Configured like this, and with the adapter in autofocus mode, custom button 2 brings up the screen that allows rapid positioning of the focus window within the field of view. When switched into manual focus mode, custom button 2 fires up a magnified view to facilitate accurate focusing. If IBIS is set to automatic, it is configured using the focal length passed by the adapter to the camera; alternatively, the 4-way controller can be used to switch into the manual setting model, e.g., if using a lens with a focal length that has not been configured into the adapter, and custom button 1 can then be used to bring up the relevant control for manual setting of the focal length. Having mastered all of this, I was beginning to feel very comfortable with the TAP, all except for one frustration – I wanted to use it with my CV ApoLanthar 180, but the default aperture/focal length settings that come standard in the adapter only allow for focal lengths up to 135 mm! Techart Pro’s promised solution to this was to provide a second phone app that allows a user to customise the focal lengths assigned to each aperture. However, at the time I received my adapter, this was not functioning. Fortunately, several weeks later, a new version of the camera app (LM-EA7-Config) was made available on the Techart Pro downloads website, and I decided to give it a trial. It proved to be very intuitive to use, which was fortunate, given the relative lack of documentation. After opening the app, the user is able to specify the focal length associated with each aperture setting through the range from F/11 to F/32 in third stop increments. I assigned mine so that my VM and FD lenses fitted into the slots in sequence F/11 – 15 mm; F/13 – 21 mm; F/14 – 28 mm; F/16 – 35 mm; F/18 – 50 mm; F/20 – 90 mm; F/22 – 180 mm; and F/25 – 300 mm. After putting the adapter into its Bluetooth communication mode (taking an image at F/90 and then turning off the camera), I was able to use the upload setting in the app to quickly write these new settings into the adapter. This not only allowed me to use it with my longer lenses – it also allowed me to associate my most commonly used focal length with a lower aperture setting, reducing the amount of adjustment wheel turning required when changing lenses. Once set up like this, I’ve found that the TAP adapter works with marvelous accuracy at middle distances. In my experience it works most quickly when using a centrally located focus window that is set to wide, a relatively wide aperture setting on the lens, and when there are reasonably high light levels. Focus acquisition slows as the focus window is moved away from a central position, even though this has the potential to be useful say for a portrait, when you want to have the subject’s eye positioned away from a central position in the frame. In practice, the slower focus when the window is moved even a moderate distance away from the centre, means that sometimes it is better to leave the focus window in a central position, focus and then recompose. Eye focus is not available as a menu selection in the camera, but face selection is. However, I found that when photographing people, I achieved the most accurate focus with a small focus window, targeting the eye, and then recomposing if necessary. Closer distances – this is one of the real advantages of the TAP adapter, augmenting the otherwise limited close focus ability of most M-mount lenses. For example, my ZM Distagon 35 mm normally has a minimum focus distance of a little under 0.7 m, but once the extension of the TAP is added in, this reduces to just 0.35 m – with my M-mount 21 mm lens it reduces to 0.2 m, and with my 15 mm lens to a crazy 0.12 m. To me, this provides an invaluable expansion of photographic opportunities. The only catch is that one has to remember to return the focus ring to its infinity position when wanting to again photograph subjects at more normal distances – otherwise you might be fooled into thinking that an adapter malfunction has resulted in a failure to focus. Note too, that the effect is much less pronounced with longer lenses, my Elmarit-M 90 mm only gets a gain of .2 m over its standard 1 m minimum focus, i.e., down to 0.8 m.
In an extreme test, I even tried it with my diminutive Canon Macrophoto 35 mm, direct mounting the lens onto the TAP adapter with my Leicaist FD-VM adapter, which delivers images at about 1:1. I shot some small flies feeding on flower nectar, and found that the adapter certainly improved my hit rate, despite the difficulty in holding the camera still. Infinity focus – I’m more ambivalent about the accuracy of the adapter when used to focus at infinity. If taking landscape shots, for example, I generally use hyperfocal settings that maximize my depth of field for a given aperture. I was surprised after taking a couple of such shots with the TAP adapter, to find that objects at infinity were often not sharply focused. I then set out to test the infinity focus performance of the TAP adapter by repeatedly shifting focus between subjects say at 5 m and infinity, and then comparing the infinity sharpness of different versions of the same scene. Results made it clear to me that for landscape use, I’m either best to put the TAP adapter into its manual focus mode, or to use my non-focusing (Metabones) adapter. 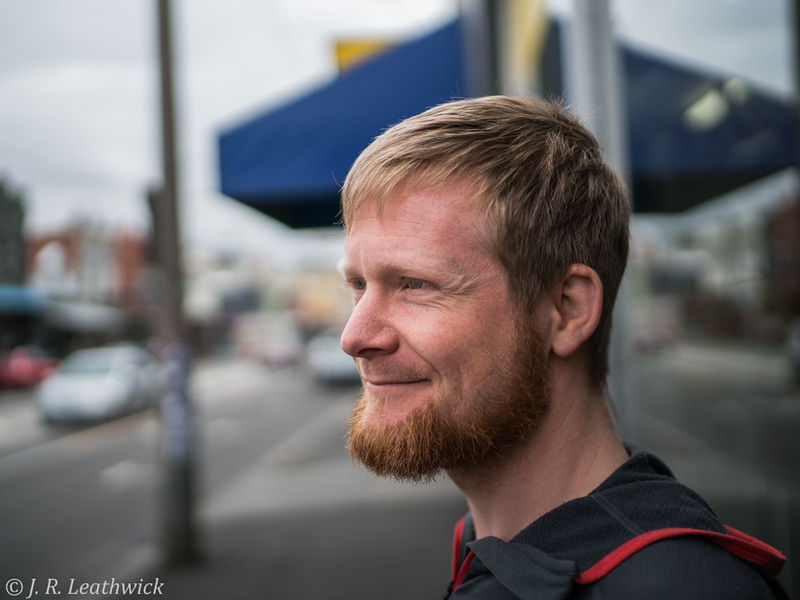 I found that wide aperture portraits with wide to normal focal lenses are spectacularly improved using the TAP adapter. Manual focusing works sort of okay using the magnify option on an A7RII, but the slightest movement of the subject can so easily shift the super-thin zone of sharp focus away from the eyes. With the TAP, this largely ceases to be a problem, particularly when using a small focusing window and placing it on the subjects eye. Ability to invoke the eye-focus routine built into the camera would be nice, but that’s not possible for the present, and can be worked around. When using longer focal lengths, say greater than 50 mm, manual pre-focussing is often necessary, particularly when the amount of extension provided by the adapter (4.5 mm) is not enough to achieve focus. Particularly with my 90 and 180 mm lenses, I’ve found that a quick manual movement of the focus ring into the approximate required position results in very quick focus acquisition with the adapter. In fact this strategy can even be used with longer lenses, provided that one is prepared to support both the lens and camera to prevent over-loading of the adapter. In using the TAP adapter both with an ApoLanthar 180 mm, and a Canon FDn 300 mm F/4 L, the percentage of my shots that achieve critical focus has gone up from probably 20% to 80%. Compatibility – unfortunately, the TAP focusing adapter only works with those Sony A-series cameras in which it can interact with the in-camera phase detection autofocus system, i.e., the Sony A7II, the Sony A7RII and the new Sony A6300. Internal focusing lenses – because the TAP adapter works by extending the distance between the lens and camera sensor, it is most suited for use with lenses in which the inbuilt focusing mechanism works by extending the lens as a whole, rather than altering the arrangement between the different lens elements. Users need to be aware of this when using lenses with more sophisticated designs that focus by moving an internal element (e.g., the Zeiss ZM Distagon 35), or have floating elements designed to improve lens performance at close distances (e.g., the Canon FD 35 F/2). My testing with a ZM Distagon clearly shows that this can result in reduced performance if the lens is set at infinity focus but is then focused with the TAP to be used at a close distance. This can be easily overcome by manually focusing the lens to the approximate distance, with the TAP then used to fine-tune the focus – this will cause a lens with moving elements to be placed into a mode that more closely matches the actual focus distance. Another issue that some users on FredMiranda.com have reported is that the battery drains when the adapter is left on the camera, even when the camera is powered down. However, not all users report this as an issue, and there is also a suggestion that the drainage behavior alters depending on the type of battery used. It is also now well documented that drainage does not occur (i) if a fresh battery is installed, but no images are taken, or (ii) if a part-drained battery is removed and reinserted. This proved to be something of an issue for me on a recent multi-day hiking trip where battery capacity was at a premium, although removing and reinserting the battery each night minimized losses. Using an L-bracket can be difficult with the TAP adapter because of the degree to which its focus motor housing protrudes down below the adapter, obstructing the ability of a number of widely available L-brackets to mount onto a tripod. Techart Pro offer for sale an L-bracket that overcomes this problem, but an alternative solution is to use a second QR plate, as in this photo. Although this latter solution is a little ad hoc, it isn’t a major issue for me, as I can’t imagine many scenarios at all when I would want to use the TAP and a tripod at the same time. Adapter fit – although the TAP focusing adapter is designed primarily for Leica M-mount lenses it can accommodate lenses with a range of other mounts, via the use of VM-mount adapters. For example, I am able to focus several nFD mount lenses by mounting them via an FD to VM adapter. Unfortunately, not all such VM adapters will fit, given the way that the cover for the TAP focus motor protrudes forward of the VM lens mount. The FAQ pages on FredMiranda.com maintains a list of adapters that are compatible. In addition, the Techart Pro website lists for sale a range of compatible Leicaist brand adapters, although many of these can be purchased more cheaply on EBay. The one-year warranty – one concern that I had in buying this adapter from a small, little-known supplier based in a foreign country was ‘what if something goes wrong?‘ – would the warranty be honored? I had no intention of testing this, but on the third day of a multi-day hike in Australia, I noticed when I switched on my camera, that the adapter failed to complete its normal movement back and forth through the focus range. To my dismay I realized that one of the two screws holding on the front cover plate had fallen out, allowing one side of the cover plate to move out of position. When I pushed it back into place, and re-tried starting the camera, it worked okay. But then the screw on the other side also came out and the entire cover plate came away. As I was on a sandy beach at the time, I quickly removed the adapter, taped the cover in place and put it safely into a sealable plastic bag. Unfortunately I was not able to find either of the small screws in the sand. The good news is that when I emailed Techart Pro about this problem, I had a reply from one of their technical support staff within four hours, requesting that I return the failed adapter to them for replacement. I had a new adapter within five days of them receiving my old one, so am now happily back in operation again. If you’re like me and all (or most) of your lenses are only manual focus, you may well occasionally encounter particular types of shooting for which having autofocus would be very useful. In these settings, the TAP is a fantastically cost-effective solution, particularly given its ability to accept not only Leica M-mount lenses, but also lenses with a range of other mounts. 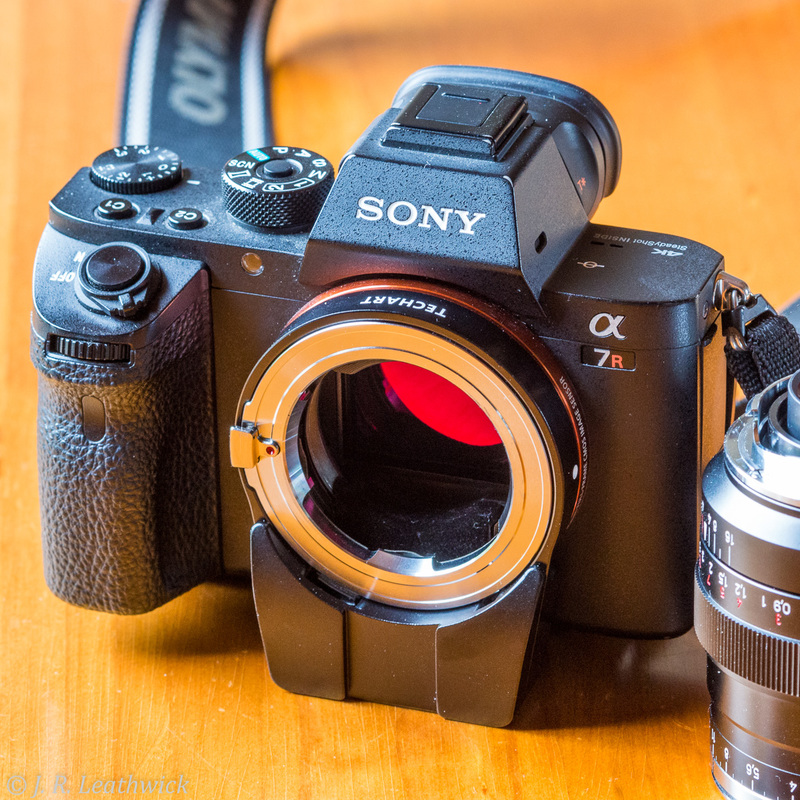 Some aspects of its operation are either unconventional or not well documented, but once these are mastered, this adapter greatly expands the range of high-quality glass that can be used on an A7II or A7RII. Please feel free to leave a comment if there are aspects I’ve either not made clear, not got right or missed. very interesting article – thank you. I just borrowed an Android Phone to adjust the focal lengths settings in the adapter to my lens collection. Unfortunately, the software onyl shows 4 f-stops (11,13,14,16) that can be used. I saw in your article that you could adress more than these. Any hints on how to get there? Sorry for the slow response – I’ve been out of communication in Aspiring National Park.